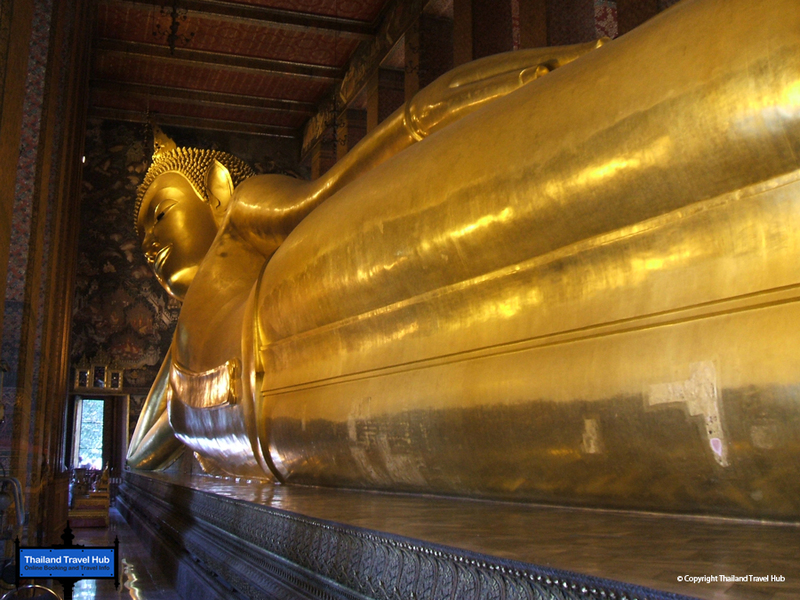 Wat Pho, or the Temple of the Reclining Buddha, is an impressive sight. 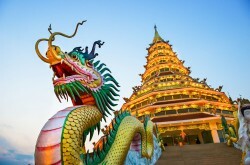 This beautiful temple complex is located south of the Grand Palace and covers a huge area of over 80,000 square meters. It is also one of the oldest sites in Bangkok predating even the city itself. King Rama I built the original temple (some of his ashes are enshrined here), while King Rama III further expanded and developed the buildings in later years. The temple is home to the largest collection of Buddha images in Thailand and you can find over 1,000 images here. The most famous, of course, is that of the reclining Buddha, a beautiful statue gleaming in gold leaf and exquisite detail. 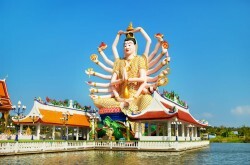 It is the largest statue of Buddha in Thailand at an enormous 46 meters long and 50 meters tall, and the unique pose is one you will not see anywhere else. Traditionally referred to as sihasaiyas or, the posture of a reclining lion, Buddha lays on the side with the right arm supporting a head depicted with tight curls. The soles of the feet are a marvel, standing at three meters high and over four meters long, they are inlaid with mother-of-pearl and divided into 108 panels, which depict the symbols by which Buddha can be identified, such as flowers, dancers, white elephants, tigers, and altar accessories. There are chakras or energy points in the centre of each foot, represented by a circle. It is easy to spend a considerable amount of time walking around the Buddha admiring the incredible artisanship and marvelling at the skill involved with making such a large yet delicately detailed statue. Another draw for visitors to Wat Pho, and Thailand itself you could say, is the chance for a traditional Thai massage. The Wat Poh Thai Traditional Medical and Massage School has been located on this site since 1955 and is recognised as the national headquarters of traditional Thai medicine and massage. Students partake in courses which last from a few weeks to a year, with classes held in two pavilions at the eastern edge of the complex. Visitors to Wat Pho are offered massages by the students free of charge. 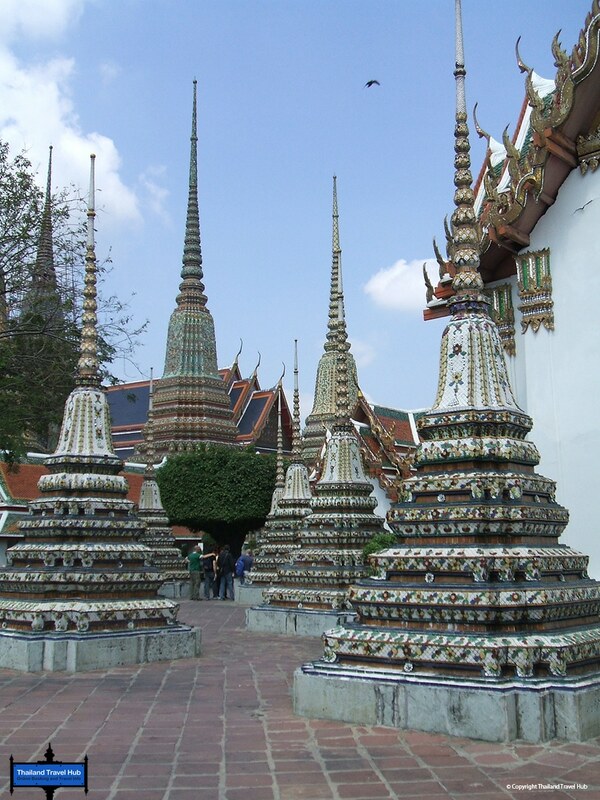 Wat Pho is a mere 10 minute walk from the Grand Palace and many visitors visit both sites in the same day. Although Wat Pho is very popular, there are fewer crowds here than at other temples around the city and you can usually wander around the complex with minimal interruption. Though not obliged, visitors can donate to the temple by dropping a few coins into one of the many bronze bowls located in the corridors, which helps the monks maintain and run the complex. 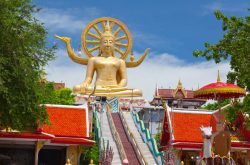 Wat Pho is an ancient, atmospheric wonder located in the heart of the city, and no visit to Bangkok is complete without a few hours spent wandering around this fascinating place.